We love a Paleo breakfast – these delicious and healthy meals can start your day off on the right foot, leaving you satiated and energized. Omelettes are an awesome way of incorporating a ton of good-for-you ingredients into a dish, but for some, traditional omelettes might be a bit too time-consuming to cook. That’s why we adore this oven-baked version – instead of standing over a skillet and carefully watching your eggs, you can let them cook in the oven until done. It makes this morning recipe a quick and budget-friendly way to eat well even at breakfast. Omelettes are by nature extremely flexible – the ingredients list below can be adapted to suit your preferences. So if you hate mushrooms, don’t discount this dish! It’s easy to leave them out and replace them with something you do like (additional tomatoes or peppers in the omelette; sliced avocado on top after cooking). 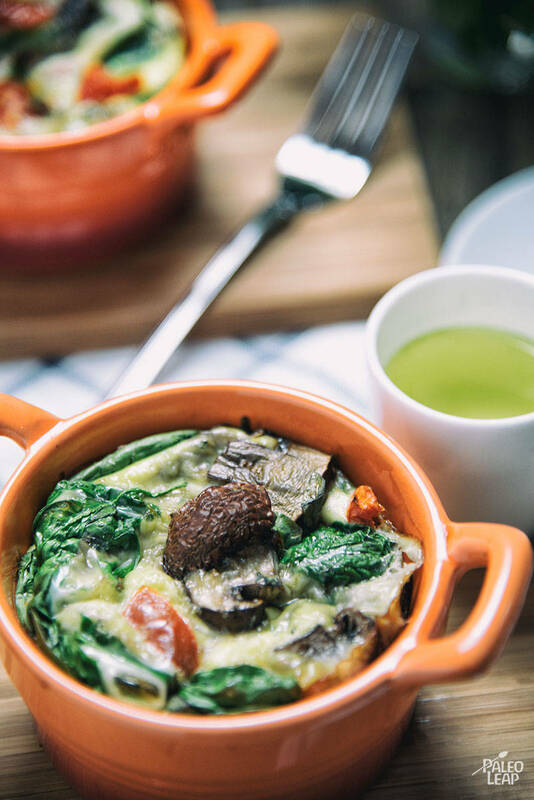 For this recipe, try cooking your omelettes in individual ramekins for easier serving. If you don’t have these on hand, a jumbo cupcake or muffin pan will also work (if you still have one around!) – just divide the mixture into separate cups and you’ll be ready to cook. For a super quick breakfast, eat these on their own or try pairing with a simple fruit salad, like the apple and grape salad (this can also be made the night before to save even more time). If you are planning on a fancier breakfast, try making some Paleo pancakes to serve as well. Whisk the eggs, the egg whites, and the coconut milk until well mixed. Divide the egg mixture into two individual oven-proof dishes (mini cocottes work great). Place the dishes in the oven and cook until no longer runny (20 to 25 minutes).